In the prioritisation of value chains conducted at the commencement of the project, vegetables was ranked fourth out of the five commodities deemed to have the greatest potential for poverty reduction and market development in the study provinces of East Java, NTT and NTB. Research on vegetable value chains was disaggregated into four separate studies: tomato, shallot, potato and chilli. This report presents the findings for the chilli value chain. The piloting of small hybrid chilli varieties. The development of local markets for Gemini-free seedlings. The expansion and improvement of existing contract farming schemes. The development of market outlook services. This study was conducted to inform pro-poor interventions in the chilli value chain under a new DFAT program: the Australia-Indonesia Partnership for Decentralisation - Rural Economic Program, or AIPD-Rural. 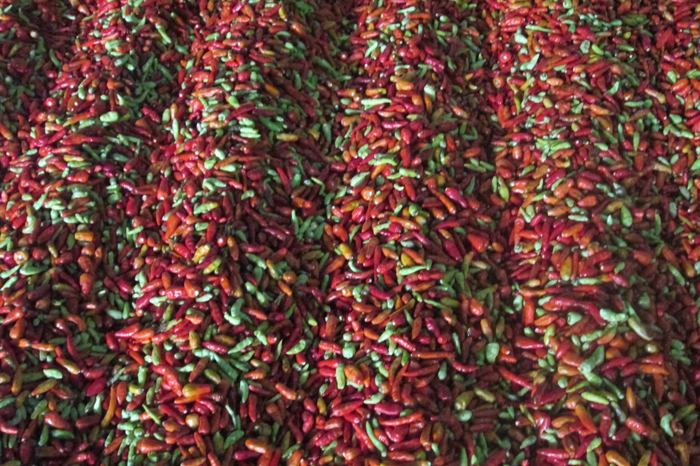 A variety of issues deemed important for characterisation of the chilli sub-sector in Indonesia are covered. There is a particular focus on understanding the potential of the chilli sub-sector as a vehicle for poverty reduction in the AIPD-Rural target district of Malang in East Java. Within this report, the chilli value chain is analysed in detail, gender and environmental issues are discussed, and possible entry points for pro-poor chain innovations are proposed. This document summarises the socio-economic importance of chilli in Indonesia and in East Java in particular. It canvasses production trends and seasonality of production, productivity, trade, demand and prices, and analyses the Malang chilli value chain. It also addresses quality management systems for chilli in Indonesia, including problems and constraints, before concluding with recommended interventions. 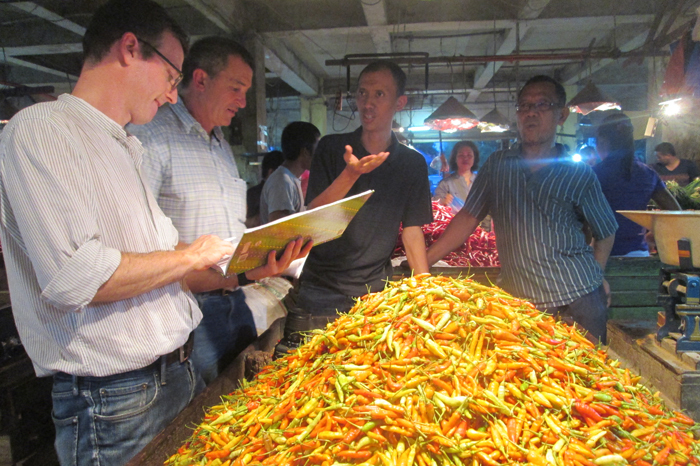 Fieldwork team interviews large scale chilli trader at Keputran grocery market, Surabaya. Chilli drying for storage at collector’s house, Pare, East Java. 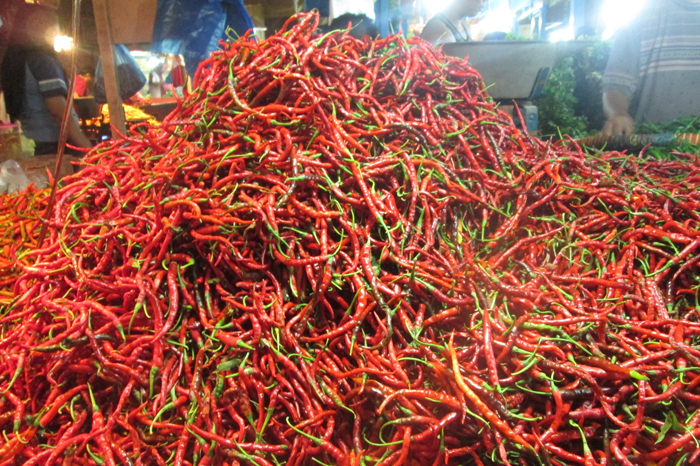 Big red chilli in Wonokromo market, Surabaya. 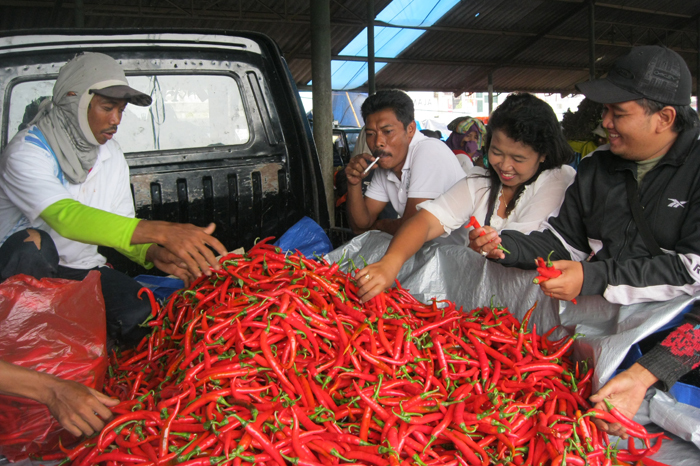 Wholesaler collecting chilli directly from farmers in Malang and selling from back of truck to retailers in Surabaya.